What's the first thing that comes to your mind when you hear the word? Wizard of Oz, Dorothy, Toto? The band who sings Dust in the Wind? Flat, treeless, sunflowers, tornadoes? Well, I can tell you that Eastern Kansas is far from flat and treeless. As for the rest, yes, we can make claims to all the above. I had intended on writing a blog on Fort Scott, Ks only, but as I started writing I realized that there is too much back story to cover, which tells me I need to start where the story starts, at the beginning. So, here we go: Kansas-the beginning of her settlement. At one time, Kansas was part of the land promised by the American government to Native Americans. In fact, Fort Scott, built in the south eastern corner of Kansas, was established in 1842 to help enforce the permanent frontier. It was one of several forts built along a line from Minnesota to Louisiana to help keep white settlers from settling west of the frontier line and to keep the peace between settlers and the Indians. This permanent frontier obviously didn't last very long, because in 1853, just nine short years later, soldiers abandoned the fort, and the government sold the buildings to private citizens. As you can imagine, this presented a problem for the tribes living in the area, and you might be thinking that all was right as rain for the whites settling in the area, but not so much. In 1854, the Kansas-Nebraska Act created the Kansas and Nebraska territories, which forced a repeal of an earlier act called the Missouri Compromise, an act that prohibited slavery in the Louisiana Territory north of the parallel 36*33' north, except Missouri. The Missouri Compromise allowed Maine to become a free state and gave the U.S. Senate equality between the free states and the slave states. Since the Kansas-Nebraska Act allowed the settlers in Kansas and Nebraska to decided through 'Popular Sovereignty' whether they would be free or slave states, the balance in the U.S. Senate threatened to tip. And that was a bad thing for either side, especially if the opposite faction gained more power. You're probably wondering why they didn't just make Kansas a slave state and Nebraska a free state. 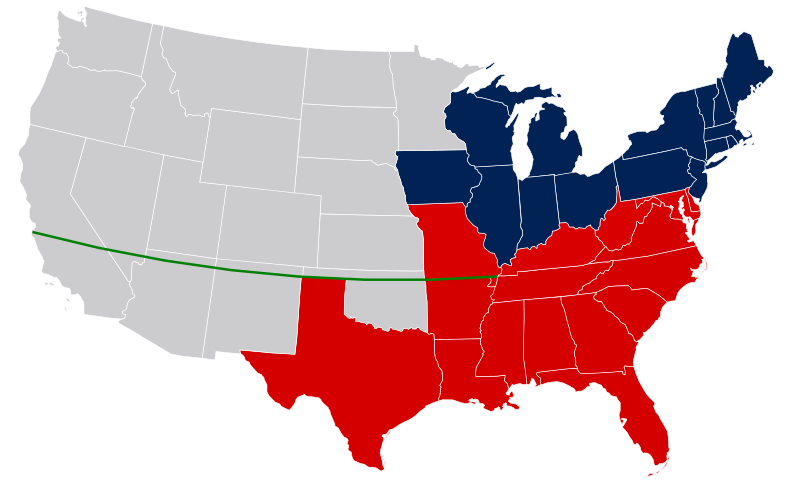 Well, Kansas was north of that parallel line stated in the Missouri Compromise and the representatives amongst the free states weren't willing to open the northern territories to slavery. And as you can imagine, representatives of the slave states could see that by keeping to the Missouri Compromise would eventually cause them to lose their equality. I can see a rosy-cheeked, white-haired law maker tossing his hands in the air and shouting, "let the settlers decide." Oh boy! Little did they know the mess Popular Sovereignty would make. Join me next month as I continue this drama. You won't want to miss Bleeding Kansas. 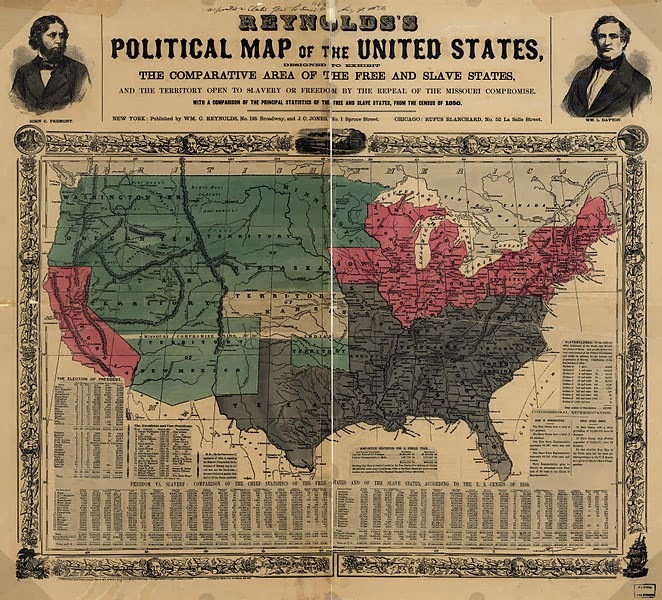 *Reynold's Political Map of the United States image is in public domain because the copyright has expired. Today, straight from the Sunflower State, I'll be giving away.....another scarf. You can see a few of them here. Christina loves to read stories with happily ever afters, research, take photos, knit scarves, dig into her ancestry, fish, visit the ocean, write stories with happily ever afters and talk about her family and Jesus. Interesting facts on Kansas, didn't know much about that area. I am happy to see you have new contract for LIH bibical romance stories...like to read these. Thank you for sharing with us! I like to hear/read the history of areas that are often forgotten. For the most part you don't hear a lot about Kansas history, except some about the Jayhawkers, the burning of Lawrence, in the old movies. I'll be looking forward to next month's post! Jasmine, first thank you for stopping by. I was surprised to find that Kansas isn't that well known, especially since the turmoil between Kansas and Missouri helped spark the Civil War. Thanks for the interesting post, Christina. This is of special interest to me since the first book in my Kansas series debuts next month. Cool! I love Kansas history!!! I love discovering all the little tidbits. Did you know that Kansas had five different capitals? Fort Riley was the first Territory Capital. Lecompton was one, but Topeka won out. I can't recall the other two right off, maybe Leavenworth. Also, something I discovered a few years ago, the story about Bleeding Kansas varies between Missouri and Kansas. Great post, Christina. So much of history I have yet to learn about. Glad you liked it, Debbie. Little is known about Kansas. Wow, you totally left us hanging for your post next month! Haha. What a lot of drama surrounding Kansas. Thanks for the interesting info. Hi, Susan, so pumped that you're excited about my Biblical! I can't wait for next month's post. Hopefully I'll leave you hanging then too. It's amazing. I had an Uncle who lived in Kansas and we went to visit him a few times, but I never learned the history of Kansas. Thank you for sharing this history with us. I'm very interested in reading your Love Inspired Historical Biblical Romance when it's published. Hi Barbara, you know what's strange? Even though I've grown up in Kansas and state history is required in school, there is so much that wasn't taught. Sure, John Brown was as well as the Dust Bowl, but that's about it. So interesting...I agree...I think sometimes we just miss out on some very important facts when it comes to the states and how influential they can be...thanks for the post...loved it. Looks like I might get the opportunity to learn more about Nebraska, which I find fascinating. My great great grandparents owned the only watering hole in the southwestern portion of the state. After the area was attacked they left. Now I'm just trying to figure out what sort of watering hole they owned. :) One with actual water or a saloon. Thanks for doing this post about Kansas history. There are many places in Kansas that are not flat, though there are some that are. I always thought it was kind of nice to "see forever." There are also many interesting aspects of Kansas history. I work at an elementary school; one of the classes I was assigned to was 4th grade geography. The kids had a unit on Kansas. It's always interesting to learn more about my home state. Pam, I haven't spent much time in the western portion of Kansas. I do love wide open spaces. I love standing on hills and looking across the valleys. I'm not sure I'd like to see forever and ever with nothing to break the horizon. I'd be interested in knowing what your favorite tidbit about Kansas is.